Two ditch diggers from New York join an archeological expedition to Egypt in hopes of striking it rich, unaware of the supposed curse. A chicken hatchery owner (and novice private eye) tries to solve the arrow murder of local milkman, philanderer and animal fetishist. A carnival huckster and his 17-year-old foster daughter try to be accepted by the townspeople when she and a handsome lad fall in love. This was the third to last film made by the comedy team of Wheeler & Woolsey and it's pretty weak stuff. Totally forgettable. As an Egyptian Mummy curse movie it at least has a dark and mysterious look to it, and is ably directed, but this is a comedy and it has the bad luck of having the "laughs" provided by W & W. Unless you have a fondness for stale vaudeville patter, you're not going to find much humor from the work of this trying team. There is a reason these guys are mostly forgotten: they weren't funny. But, oh, do THEY think they are. In film after film, including this one, the duo practically burst out laughing at their own antics. And this film was a financial flop when it came out; so much so that RKO even fired the director Fred Guiol right off the lot. He only managed to keep a career in Hollywood because of his pal, director George Stevens. Amazingly, this stale muffin was written by THREE writers. 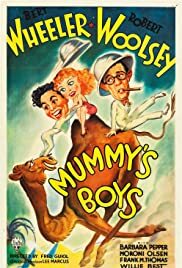 As one critic put it at the time: "Mummy's Boys" is a seven reel comedy that is eight reels too long." I would like to add that there is one Wheeler & Woolsey comedy that, to me, was actually pretty funny: 'Diplomaniacs.' It has a zany Marx Brothers feel to it and is very reminiscent of W.C. Fields' wacky film 'Million Dollar Legs.' Even Wheeler & Woolsey could score once, in my book.